My Review of a Great Book! - Owl Mountain Music, Inc.
You are here: Home / book / My Review of a Great Book! 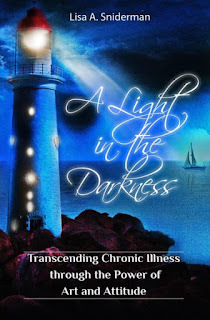 "Creating transforms the lens through which I see the world"
Lisa Sniderman's new book shines a light in the darkness of deep disruption: a body that is afflicted with a puzzling condition that tries to coax the mind and soul into the pit of despair and isolation. An award-winning singer-songwriter who built a following with her art and her persona Aoede (the muse), Lisa found this character inspired her to recreate her life and career after surviving a debilitating illness. "Creating transforms the lens through which I see the world," she writes. Lisa quotes the African proverb: "When the music changes, so does the dance." And then she describes quite honestly and clearly the new moves and steps that she has taken in the new dance which have helped her not only to heal, but to thrive and inspire others to heal and thrive. While this dance is intensely personal, it is not a solo, and Lisa celebrates the web of relationships that all the dancers and music makers have contributed and shared to carry her through and forward.